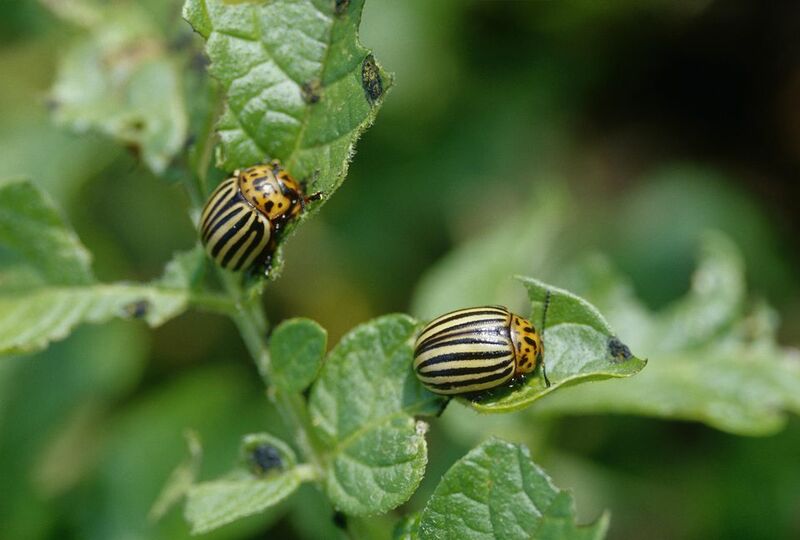 The Colorado potato beetle (Leptinotarsa decemlineata) is by far the biggest pest for both backyard and commercial potato growers. These tiny beetles with orange and black stripes are prodigious breeders, and each female can lay up to 25 eggs at a time. Once the eggs hatch, the larvae do the majority of the damage to potato plants while satisfying their voracious appetites. As many gardeners soon realize, these beetles are extremely difficult to get rid of. They have adapted a resistance to most control methods, both conventional and organic. As a result, your best weapons for dealing with potato beetle are vigilance and speed. There are a few methods that work well against potato beetle. They all require that you pay close attention to what is happening in the garden and act quickly. If you can start combating the beetles as soon as you see evidence of them you have a better chance of saving your potato crop. Effective organic controls include treating with insecticidal oil and removing the bugs manually. Apply neem oil as needed. This is the organic gardener's go-to insecticide, and it works wonders, even better than most conventional options. Hand-pick beetles, larvae, and eggs and throw them in a bucket of soapy water to kill them. Use a vacuum to remove beetles, larvae, and eggs. There are special "bug vacs" for garden use, but a regular household handheld vacuum also works well. Another good approach—whether it's before you ever see a beetle or after you've removed them—is to protect your potato crop from this hungry pest. For the best results, try a few different methods together. This is especially true if you've had a problem with potato beetles in the past. Crop rotation: Don't grow potatoes in the same spot year after year. The adults overwinter in the soil of the previous years' potato patch. If you plant in the same spot as last year, you're simply giving the adults convenient access to your plants. They'll pick a plant, find a mate, and go about laying eggs. If they're going to try to devour your crop, at least make them work for it! Floating row covers: Place floating row covers over the top of your potato plants, and leave them in place. This special fabric allows air and light through but will foil hungry potato beetles. Companion planting: There are several plants that deter potato beetles. Try planting at least one or two of them alongside (or even interplanted with) your potatoes. A few good options include catnip, tansy, and sage. Be aware that catnip and tansy can spread easily. You can keep them in check by not letting them go to seed and pulling any unwanted young plants right away. Several varieties of sage are pretty good about staying in place. Mulch with straw: Mulching heavily with straw not only helps keep the tubers out of the sunlight but also creates a habitat for predators of Colorado potato beetle. If you can attract ground beetles, ladybugs, and green lacewings, they'll do a lot of the hard work for you. Plant resistant or early varieties: Certain varieties of potatoes, such as Russet Burbank, have proven to be resistant to potato beetles. Another good practice is to plant early varieties since potato beetle damage only gets worse as the season goes on and all the eggs hatch. Consider planting Caribe, Norland, or Yukon Gold potatoes; these are all great early-season options.